Instek Digital™ video recorders are designed to satisfy the dynamic needs of the emerging digital video surveillance market. With high video image resolution - seamlessly integrated mass storage, alarm recording and hybird camera configuration. Instek Digital video recorders meet the performance of today's enterprise level installations. The high performance enterprise-class 3U series NVR, like its 3U series DVR counterparts, delivers the highest standard in performance. Dual power supplies, 8 to 12 hard drive bays, and optional RAID-5 and RAID-6 capability ensure that critical data will be safe even in the event of mechanical failure. Instek Digital NVRs support numerous IP camera compression formats for maximum flexibility. Instek Digital 2U series NVRs provide a range of options to suit any security system. The 2U delivers great power and value in a compact design with support for numerous IP camera compression formats. With models offering four or eight hard drive bays and optional RAID-5 and RAID-6 support you can choose the configuration appropriate for your individual needs. Instek Digital sleek 5400-1U NVR is an economical network video recorder. This 1U rackmountable device is designed for enterprise level video surveillance focussed on external storage devices. Video-data transferred from the IP-camera are directly stored on either a DAS-SAS, IP-SAN or JBOD external storage device. Instek Digital Serial Attached SCSI II JBOD Storage features the latest SASII (6Gb/s) interface and designed to fit in with the environment which needed highly reliable and relentless data growth. Instek Digital™ NVR Failover server is a redundant NVR server - which automatically takes over operation of the NVR server in case of a malfunction. Ensuring non-stop NVR recording - Instek Digital™ designed the NVR Failover server. Instek Digital™ system architecture has been designed to eliminate single point of failure and allow maximum uptime. The distributed architecture of Instek Digital allows any failover NVR to take over the operations of a failover NVR. Even a failing NVR FO can be taken over. In contrast with a central architecture - which requires a central server and risk single point of failure. Instek Digita™ distribute architecture provides flexibility - without any risk of video-loss. 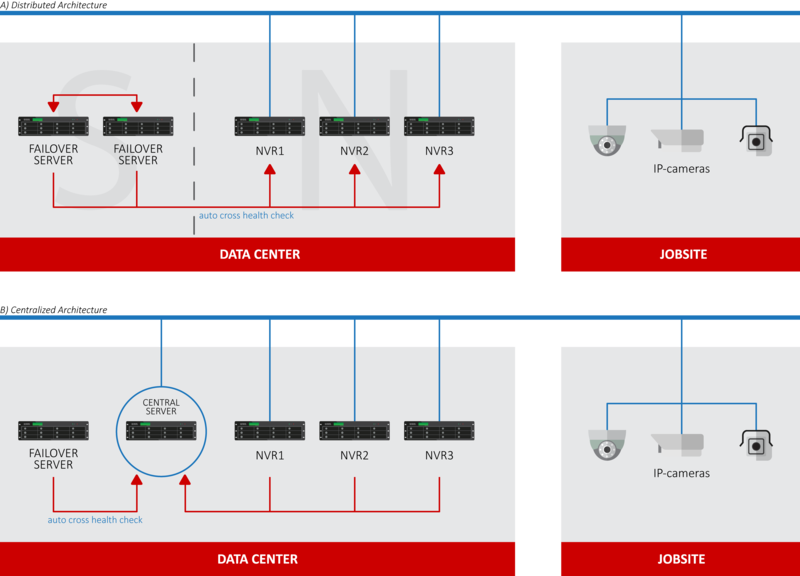 Instek Digital™ distributed architecture - multiple NVR’s are connected to the network and in any case a failure occurs - Instek Digital’s NVR Failover server (NVR-FO) will take over the functionalities of the original failing NVR. This results in a seamless operation without any interruption. N represents the operation of the host and S represents the standby host.